WAIST HIGH: INXS To Release A Covers Album. INXS To Release A Covers Album. From rollingstone.com: For their first album in five years, INXS are "reimagining" their classic hits with different arrangements and singers, including Ben Harper, Rob Thomas and the Killers' Brandon Flowers. The still-untitled release is slated for the fall. "'Original Sin' with Rob Thomas almost has a Cuban connection with some Spanish rap in it. That was really exciting," drummer Jon Farris tells Rolling Stone, adding that Thomas also recorded a version of "Never Tear Us Apart." He says many backing tracks were laid down in London with most of the London Symphony Orchestra, "So that is really rich and juicy and almost has a James Bond-y sort of rhythm bed along with that. So it was the juxtaposition of the classic and Sixties' secret agent." Brandon Flowers did a really beautiful, heart-wrenching rendition of "Beautiful Girl" when the Killers were in Australia for V-Fest. Ben Harper sang "Devil Inside" when INXS were in L.A. before Christmas. Nikka Costa and Tricky have also "been involved," although Farriss won't say on which tracks. He is also trying to prepare a song for Argentina’s Deborah de Corral so she can sing one in Spanish and English. While INXS will record another original studio album in the future, this new one - on their manager Chris Murphy's Petrol Records is "a transitional step," says Farriss. "We wanted to use to some of our existing songs and invite and integrate some well-known singers and very experienced and seasoned singers, friends of ours, and some up-and-coming artists, and just make it a collaboration of getting INXS to be involved in all sorts of things - and using the original material as the focal point." 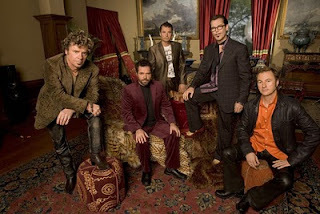 INXS formed as The Farriss Brothers in 1977 and are currently Garry Gary Beers, Andrew Farriss, Jon Farriss, Tim Farriss, and Kirk Pengilly.